Compare Under-Sink Reverse Osmosis Water Filtering and Purification Systems: iSpring, Home Master or APEC Water? The treated water supplied to our homes can still contain some impurities and some bad taste due to chemicals such as chlorine or fluoride used during the treatment. But even more important, for people living in rural areas where no water treatment is available, and where water is obtained from wells or other sources such as lakes or streams, it becomes critical to eliminate impurities such as harmful bacteria, viruses and various unwanted contaminants. Water filter pitchers provide good filtering for tap water for a small number of people and mainly for drinking. But for those who need to filter also harmful microorganisms that can be found in non-tap water, and who need to filter water not just for drinking, but also for cooking and for larger families, water filter pitchers are not adequate. They need more powerful, larger filtering and purification systems. These larger and powerful systems come mainly in two forms: they are either under-sink systems driven by water pressure to accomplish the filtration or countertop systems driven by gravity. Note that in this review, we will be considering only the under-sink water filtering and purification systems. If you prefer countertop systems, please click the following link: Countertop Water Filtering and Purification Systems. The three under-sink water filtering and water purification products that will be considered here are iSpring, Home Master and APEC Water which are the best and most popular Reverse Osmosis units on the market. Note that Home Master was previously known as Tap Master. ​Reverse Osmosis systems achieve very high filtering specifications. The filtering is achieved by household water pressure pushing the water through a special semi-permeable membrane with ultra small pores (from 0.001 to 0.00001 micron). The membrane allows only clean water to pass through, filtering all impurities or contaminates. While reverse osmosis can be very effective in removing bacteria and viruses, it is not recommended that it should be the only type of purification for untreated water coming from wells, lakes or rivers that may contain microorganisms such as viruses and bacteria. In such situations, it is recommended to consider a combined reverse osmosis and ultraviolet treatment system for maximum effectiveness. You will find below a description of systems from both types: those that only use reverse osmosis filtering and that should mostly be used with treated tap water, and those that use both reverse osmosis and ultraviolet treatment for maximum protection with untreated water that comes from wells, lakes and rivers. iSpring produces some of the best under-sink water filtering and purification systems available today. They use multi-stage filtering coupled with the Reverse Osmosis (RO) technology. The filters used within these systems have 5-micron pores and the RO membrane has 0.0001 micron ultra fine pores. All products come with 5-stage basic filtering that eliminates all impurities except for all microorganisms such as viruses and bacteria. A 6th and 7th stage are provided in specific iSpring systems to eliminate also completely these microorganisms (UV stage) and to produce alkaline water. Filter change requirements depend on the amount of usage and the hardness of water. On average, the filters need to be changed every 6 months except for the RO membrane which needs to be changed every 2 years. iSpring products can be divided in two categories: iSpring RO Purification Systems for untreated water and tap water and iSpring RO Filtering Systems for tap water only. These systems are equipped with a multi-stage filtering system that removes cysts, heavy metals, toxins, rust, dust, particles, cloudiness, unpleasant chlorine taste, colors, and odors. They also expose the water to UV (ultraviolet) light to eliminate 99% of microorganisms such as bacteria and viruses. They produce pleasant tasting and healthier water that can be used for cooking, drinking and hydroponics (growing plants in water without soil). Some systems (see below) also produce pH-balanced alkaline water. They can filter either 75 GPD or 100 GPD depending on the system chosen (GPD = gallons per day). iSpring 6-stage 100 GPD RO UV System with Booster Pump (model RCC1UP): 100 GPD system with 6-stage filtering for total water purification (including microorganisms). iSpring 7-stage 75 GPD RO UV System (model RCC7AK-UV): This system has an additional stage that produces pH-balanced alkaline water. 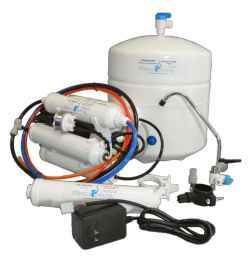 iSpring 7-stage 100 GPD RO UV System with Booster Pump (model RCC1UP-AK): This system has an additional stage that produces pH-balanced alkaline water. These systems may not filter completely microorganisms such as bacteria and viruses and must be used with tap water or potable water only. They produce good tasting and healthier water that can be used for cooking, drinking and hydroponics. These units are equipped with a multi-stage filtering system that removes heavy metals, toxins, rust, dust, particles, cloudiness, unpleasant chlorine taste, colors, and odors. Some systems (see below) also produce pH-balanced alkaline water. iSpring 5-stage 75 GPD RO System with Clear Housing (model RCC7): 75 GPD system with 5-stage filtering for water filtration that includes all impurities except for bacteria and viruses. iSpring 5-stage 75 GPD RO System with Booster Pump (model RCC7P): 75 GPD system with 5-stage filtering and a booster pump for water filtration that includes all impurities except for bacteria and viruses. iSpring 6-stage 75 GPD RO System (model RCC7AK): This system has an additional stage that produces pH-balanced alkaline water. iSpring 6-stage 75 GPD RO System with DI (De-ionization) Filter (model RCC7D): 75 GPD system with the same five stages as the RCC7 along with a DI filter that uses a process called de-ionization. This makes the water from this system also suitable for filling aquariums. The Home Master Reverse Osmosis water filtration and purification systems are designed to convert your tap water or well water into healthy, pure, odorless, and delicious drinking water that can be used for cooking, drinking and hydroponics. Like iSpring, the Home Master systems use multi-stage filtering coupled with the Reverse Osmosis (RO) technology. All Home Master RO systems are able to eliminate up to 98% of harmful chemicals, dissolved solids, toxins, rust, dust, particles and cysts. The Home Master UV systems also eliminate viruses and bacteria and all other microorganisms by exposing the water to UV (ultraviolet) light. Some systems are also designed to eliminate the large quantities of iron that can be found in well water. All filters have 5-micron pores and the RO membrane has 0.001 micron ultra fine pores. Filter change requirements depend on the amount of usage and the hardness of water. Normally, the filters need to be changed once a year except for the RO membrane that needs to be changed every 3 to 5 years. 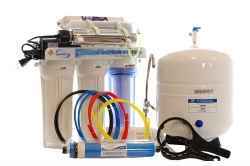 The Home Master Systems consist of a purification unit and a reserve tank of 3.2 gallons. The two parts are connected with tubing. The purification unit is 16 inches high and 8 inches wide, while the reserve tank is 15 inches high and 11 inches in diameter. 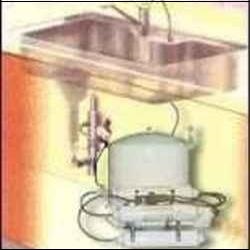 They can easily fit under most sinks, and all required parts as well as detailed documentation are provided for installation. If you are not handy, a plumber can do the job in minutes. Note that all Home Master systems come with a 5-year limited warranty, and a 90-day 100% satisfaction money back guaranty. These systems can filter microorganisms such as bacteria and viruses besides filtering all the other impurities listed above and can be used both with untreated water (such as well water) and tap water. Up to 50 GPD (gallons per day) can be filtered. Home Master ULTRA UV RO Water Purification System: This 6-stage filtration system produces exceptionally clean water by first removing up to 98-percent of chemicals, dissolved solids and other impurities using the RO technology and carbon filtration, then redirecting the water through a UV (ultraviolet light) chamber which destroys 99.9% of microorganisms such as viruses and bacteria. It is also designed to filter the iron found in some well waters as the RO membrane can get damaged overtime by the iron in the water. Home Master Ultra UV RO Water Purification System with Permeate Pump: This 6-stage filtration systems does everything the Home Master ULTRA UV RO system does, but in addition it is equipped with a non-electric permeate pump that maximizes limited water pressure, reduces water waste while increasing water production. Home Master Hydro-Perfection UV RO Water Purification System: This 9-stage filtration system does everything the Home Master Ultra UV RO Water Purification Systems with Permeate Pump system does, but in addition, with its patented Full Contact technology, it adds calcium and magnesium minerals twice during the purification process for even better tasting water. This system is the top level water purification system that comes with all possible and required features. It represents perfection in water purification which also explains the higher price. These systems may not filter completely all microorganisms such as bacteria and viruses and must be used with treated tap water or potable water only. They can eliminate up to 98% of harmful chemicals and dissolved solids, toxins, rust, dust, particles and cysts. There are specific systems used in specific applications as shown below. They can filter up to 50 GPD (gallons per day). Home Master RO Water Filtering System: This is the most basic Home Master system for tap water filtering. It can eliminate up to 98% of harmful chemicals and dissolved solids, toxins, rust, dust, particles and cysts. It does not filter microorganisms such as bacteria or viruses. Home Master Artesian Full Contact RO Water Filtering System: This unit filters perfectly the water (except for viruses and bacteria), and then it remineralizes it to obtain an alkaline pH level balance of 7.5 to 8 which is ideal for the body to absorb. The patented Full Contact technology adds calcium and magnesium minerals twice during the purification process for great taste. It has in all 7 filtering stages. Home Master Artesian Full Contact RO System with Permeate Pump: This systems does everything the Home Master Artesian Full Contact RO Water Filtering System does, but in addition it is equipped with a non-electric permeate pump that maximizes limited water pressure, reduces water waste while increasing water production. This is definitely the top of the line Home Master system for tap water filtration. ​APEC water filtration and purification systems are also designed to convert your tap water or well water into healthy, pure, odorless, and delicious drinking water that can be used for cooking and drinking. Like iSpring, and Home Master, the APEC systems use multi-stage filtering coupled with the Reverse Osmosis (RO) technology. All APEC systems claim to eliminate up to 99% of contaminants including arsenic, chlorine, lead, fluoride, heavy metals, bacteria, and viruses. Per product descriptions, all APEC systems claim to remove viruses and bacteria. However, for untreated non-tap water, such as water from wells and rivers, we recommend getting an APEC system with a built-in UV (ultraviolet) stage to make sure that all viruses and bacteria are indeed destroyed. The systems consist of a filtering/purification unit and a reserve tank of 4 gallons connected with tubing. They can easily fit under most sinks, and all required parts as well as detailed documentation is provided for installation. If you are not handy, a plumber can do the job in minutes. APEC ROES-50 Reverse Osmosis Water Purification System: This system claims to remove up to 99% of contaminants including arsenic, chlorine, lead, fluoride, heavy metals, bacteria, virus and 1000+ contaminants. It is WQA certified with a 1-year satisfaction guarantee. The system comes with 100% lead-free chrome faucet, plus NSF & FDA certified JG food grade tubing to provide safe, contamination free pure water. It can filter up to 50 gallons per day. APEC ROES-PH75 pH alkaline Reverse Osmosis Water Purification System: This system claims to remove up to 99% of contaminants including arsenic, chlorine, lead, fluoride, heavy metals, bacteria, virus and 1000+ contaminants. The system also adds calcium carbonate to effectively raise the pH level in the water for those who desire alkaline water. It can filter up to 75 gallons per day. APEC ROES-UV75 Reverse Osmosis Water Purification System: This system claims to remove up to 99% of contaminants including arsenic, chlorine, lead, fluoride, heavy metals, bacteria, virus and 1000+ contaminants. For extra protection, an ultraviolet (UV) light exposure stage is also included. It can filter up to 75 gallons per day. Note: Though according to product descriptions, all APEC systems claim to remove viruses and bacteria, for untreated non-tap water, such as water from wells and rivers, we recommend getting an APEC system with the built-in UV (ultraviolet) stage to make sure that all viruses and bacteria are indeed destroyed. So which of the three under-sink water filtering and purification systems should you get? ​Clearly, all three water purification systems have received a negligible amount of ratings below 4 stars which shows a very high degree of satisfaction with all three products. However, at 89.4%, the Home Master 5-star rating is huge and above the 86.9% and 74.8% 5-star ratings received respectively by APEC and iSpring! While the ratings received by APEC and iSpring are also quite impressive, the table shows customers were even more satisfied with Home Master systems. Though one needs to keep in mind that there had been a lot more reviews for iSpring, the Home Master rating results say something about the quality, easy of use, installation, and filtering/purification results of the product. 1. If you want to get rid of microorganisms in your water (such as viruses or bacteria), then you should definitely choose a system with UV (ultraviolet) processing. All three brands provide such systems. 2. Home Master systems require the least amount of filter changes. Filter change requirements depend on the amount of usage and the hardness of water. Normally, Home Master filters need to be changed once a year except for the membrane that needs to be changed every 3 to 5 years. On the other hand, on average, the filters on iSpring and APEC systems need to be changed every 6 to 12 months except for the membranes that need to be changed every 2 to 3 years. 3. If your water pressure is low, an iSpring system with a booster pump (Model: RCC1UP-AK) or a Home Master system with a permeate pump (Model: TMULTRA-ERP or TMHP) would be ideal. 4. If you want to use the water in aquariums, then you should select the iSpring DI (de-ionization - Model: RCC7D) system which produces water suitable for aquariums. 5. If you want your water to be more alkaline, then you should get either the APEC ROES-PH75, the iSpring RCC7AK-UV or Home Master TMA or TMHP. 6. iSpring and APEC both provide a 1-year limited warranty while Home Master provides a 5-year limited warranty and a 90 day 100% satisfaction money back guaranty. 7. 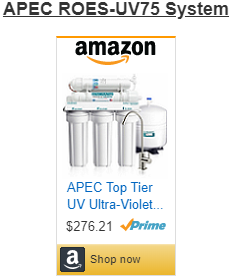 Finally, note that at the time this article was written, APEC ROES-50 was the top seller on Amazon in the under-sink water purifiers category due to its lower price for the high quality of the product and the features it comes with. You can find the various water filtration/purification systems referred to here, in the Amazon products section that follows. You can obtain below on Amazon all iSpring, Home Master and APEC water filtering and purification systems described in this review, as well as replacement filters. iSpring 6-stage 100 GPD RO UV System with Booster Pump (model RCC1UP): 100 GPD Model with 6-stage filtering for total water purification (including microorganisms). iSpring 7-stage 75 GPD RO UV System (model RCC7AK-UV). This model has an additional stage that produces pH-balanced alkaline water. iSpring 7-stage 100 GPD RO UV System with Booster Pump (model RCC1UP-AK): This model has an additional stage that produces pH-balanced water. ​iSpring 5-stage 75 GPD RO System with Clear Housing (model RCC7): 75 GPD Model with 5-stage filtering for water filtration that includes all impurities except for bacteria and viruses. iSpring 5-stage 75 GPD RO System with Booster Pump (model RCC7P): 75 GPD Model with 5-stage filtering and a booster pump for water filtration that includes all impurities except for bacteria and viruses. iSpring 6-stage 75 GPD RO System (model RCC7AK): This model has an additional stage that produces pH-balanced alkaline water. iSpring 6-stage 75 GPD RO System with DI (De-ionization) Filter (model RCC7D): This model has the same 5-stages as RCC7 and an additional de-ionization stage that produces water suitable also for aquariums. This 6-stage purification system produces exceptionally clean water by first removing up to 98-percent of chemicals, dissolved solids and other impurities using the RO technology and carbon filtration, then redirecting the water through a UV (ultraviolet light) chamber which destroys 99.99% of microorganisms such as viruses and bacteria. It is also designed to filter the iron found in some well waters as the RO membrane can get damaged overtime by the iron in the water (Model: TMULTRA). This 6-stage purification system does everything the Home Master TMULTRA UV RO system does, but in addition it is equipped with a non-electric permeate pump that maximizes limited water pressure, reduces water waste while increasing water production. It removes up to 98 percent of iron and other contaminants while safely sterilizing 99.99 percent of microorganisms. The included permeate pump will reduce water waste by up to 80% while increasing water production by up to 50%. It is also designed to filter the iron found in some well waters as the RO membrane can get damaged overtime by the iron in the water (Model:TMULTRA-ERP). This unique 9-stage purification system does everything the Home Master Ultra UV RO Water Purification Systems with Permeate Pump system does, but in addition, with its patented Full Contact technology, it adds calcium and magnesium minerals twice during the purification process for even better tasting water.It removes up to 98 percent of iron and other contaminants while safely sterilizing 99.99 percent of microorganisms. The included permeate pump will reduce water waste by up to 80% while increasing water production by up to 50%. It is also designed to filter the iron found in some well waters as the RO membrane can get damaged overtime by the iron in the water. This system is the top level water purification system that comes with all possible and required features. It represents perfection in water purification which also explains the higher price (Model:TMHP). This 5-stage filtering system is the most basic Home Master model for tap water filtering (Model: TM). This 7-stage system filters the water up to 98 percent of chemicals, including chloramine, and other contaminants and then it remineralizes it to obtain an alkaline pH level balance of 7.5 to 8 which is ideal for the body to absorb. The patented Full Contact technology adds calcium and magnesium minerals twice during the purification process for great taste. (Model: TMAFC). This 7-stage system does everything the Home Master Artesian Full Contact RO Water Filtering System does, but in addition it is equipped with a non-electric permeate pump that maximizes limited water pressure, reduces water waste while increasing water production (Model: TMAFC-ERP). This system claims to remove up to 99% of contaminants including arsenic, chlorine, lead, fluoride, heavy metals, bacteria, viruses. The system comes with 100% lead-free chrome faucet, plus NSF & FDA certified JG food grade tubing to provide safe, contamination free pure water. It can filter up to 50 gallons per day. (Model: ROES-50). This system claims to remove up to 99% of contaminants including arsenic, chlorine, lead, fluoride, heavy metals, bacteria, viruses. The system also adds calcium carbonate to effectively raise the pH level in the water for those who desire alkaline water. It can filter up to 75 gallons per day. (Model: ROES-PH75). This system claims to remove up to 99% of contaminants including arsenic, chlorine, lead, fluoride, heavy metals, bacteria, viruses, etc. For extra protection, an ultraviolet (UV) light exposure stage is also included. It can filter up to 75 gallons per day. Note: Though according to product descriptions, all APEC systems claim to remove viruses and bacteria, for untreated non-tap water, such as water from wells and rivers, we recommend getting this UV (ultraviolet) unit to make sure that all viruses and bacteria are indeed destroyed. (Model: ROES-UV75). Note that Tap Master is the old name for Home Master systems. Tap Master filters will fit the Home Master Systems.